Processing encompasses every step that happens from the moment a coffee has been handpicked at harvest to when it is dry milled and readied for shipment. Every variation in the process can affect the final flavor profile of the bean. Processing coffee varies greatly from farm to farm and region to region. The amount of time that the coffee cherry is stored, the method by which it is pulped, cleanliness of equipment, fermentation type and amount of time, water quality, speed and temperature of the drying process are all major factors that can affect the flavor of a coffee within the same processing category. 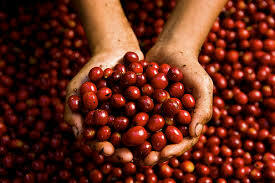 The natural process is the original manner in which coffee was processed. The cherries are dried with the beans inside, like drying grape into a raisin. The beans are dried with all of their layers intact. The result is the dense heavy body and exotic, wild berry flavors that have become synonymous with natural processed coffees. However, the cup profiles of natural processed coffees can be inconsistent, which customers should be aware that results may vary among single-origin coffees especially natural-processed coffees. The washed process involves completely removing both the cherry and the mucilage from the outside of the parchment with the use of friction, fermentation and water. Famous for the clarity and complexity of its flavor profile, Kenyan coffee undergoes two fermentations. Once gone through the fermentation process, Kenyan coffees are washed, soaked in water then dried. Another important aspect of processing, the drying stage must remove moisture gently and consistently. There can be an unevenness when drying happens rapidly, affecting the coffee taste. Too much heat during the drying process can damage the cell structure of the bean. Too little airflow, too many beans piled together, or humid conditions can overly extend the drying process, allowing fermentation, rot or mold to develop and negatively affect the flavor profile. The final moisture content of the green bean should be between 10-12%. There are four typical methods of drying coffee: concrete or clay patios; raised drying beds; covered, raised beds and mechanical dryers. Ideally, the parchment should remain surrounding the bean for 15-90 days. This strengthens the cell structure of the green bean and extends the shelf life of the green coffee. The parchment serves as a protective barrier for the coffee to help maintain more consistent moisture and keep unwanted flavors out. Dry milling includes removing the parchment from the outside of the green bean, sorting out defects and packaging. This is the final step before shipping the coffee. At the dry mill, the coffee is often mechanically sorted to remove defective beans and separated by size and/or density.